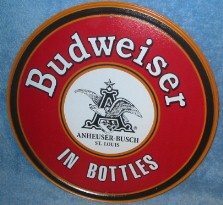 Budweiser In Bottles; 11 3/4 inch round metal sign that has a 2004 copyright. Has two mfg-made hanging holes. Official A-B advertising. Unused.